After dancing her way through high school and college, Ann made the graceful transition to practicing Pilates in 2002. A few years later she was certified to teach mat Pilates by Power Pilates. In 2007 Ann went on to complete her RYT-200 hour yoga training. 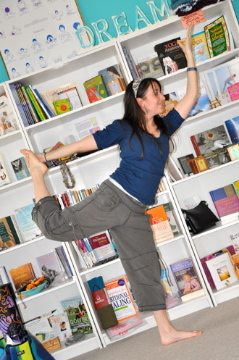 At the studio you can find Ann teaching the Yoga/Pilates combination classes as well as Ashtanga, T.C.B., and Vinyasa. Ann is also one of just a handful of teachers in Michigan recognized by Yoga Alliance as a certified Children’s Yoga Teacher. There is nothing like watching the inner light of children shine as they practice yoga, and Ann is completely dedicated to sharing yoga with as many children as possible! Ann realized many years ago that it is is her passion and her mission to teach. In addition to teaching yoga and Pilates, she has experience teaching Spanish, English as a second language, elementary education, and hip hop dance. All of her students are a great inspiration to Ann, and she is grateful for the many lessons they have taught her as well.